I’ve recently been watching the Netflix “Original” anime The Seven Deadly Sins a much different beast from their first “Original” series Knights of Sidonia. 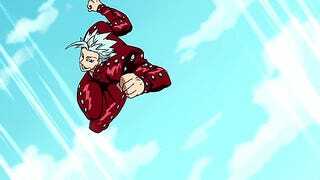 You see The Seven Deadly Sins is your standard Shōnen anime in almost every way except there is something strange about it... it rocks. Honestly I’m not sure what it is about it but the series just grabs you, not since Fairy Tail literally YEARS ago has a Shōnen anime grabbed me so completely. Hell even Fairy Tail took that series a good two arcs to really get good (Tower of Heaven arc for reference sake) while The Seven Deadly Sins is captivating right from the first episode from the start. What makes it so good sadly is kinda hard to articulate, the animation and character designs are fine if nothing special, the characters mostly fit into the general cliched archetypes, and the fights while entertaining are really not inventive. What I’m saying is The Seven Deadly Sins doesn’t try to reinvent the wheel and if you’re not a fan of the genre before this it’s not likely this show will change your mind, Tokyo Ghoul this is not. What is is however in many ways a testament to how something can be better then the sum of its parts. Looking at the characters which you meet over the course of the first cour of the series each appears flat at first but begins to resonate as an ensemble. First you have the Meliodas the Dragon Sin of Wrath the leader who is your standard Shōnen protagonist; good spirited, kind, and loyal. Of course he is also ridiculously strong to the point it ruins the tension of the early episodes. He’s also mysterious and kind of a letch (we’ll get to that later). Second up is Diane the Sin of Envy she’s a giant one of the three non-human races that shares the world of Sins, her particular sin becomes apparent later in the series. Finally rounding up the cast is my particular favorite character Ban the Sin of Greed; who is basically Greed from Full Metal Alchemist I’m not joking they’re literally the same character, hell Ban’s character design is almost copyright infringement. Furthermore the action is all around amazing and fun. As you can see above it’s also suitably graphic however at the same time it doesn’t really lose it’s flare. With each character possessing unique powers its more in line with the current generation of Shōnen shows rather then the beam spam shows of the 1990’s and gives each new opponent a chance to be a unique addition to the cast, even though the show admittedly often fails at actually making them interesting. The one issue with the early going’s of the series as I alluded to above is the lack of tension anytime a Sin gets serious as their power has been shown to be overwhelming in most situations. This thankfully is kinda alleviated during a tournament arc (ya... this show has a tournament arc original I know...) where the real show is the Sins wailing on each other. After all this as you can probably see the series doesn’t strive to be original in really anyway it just attempts to be entertaining and really it succeeds. What is strange though is it’s not a dumb kind of entertainment (well relative to other Shōnen adventures anyways) as you quickly find the whole thing flows with a purpose. Indeed each arc after a few forgettable entries early on flows quite nicely as the series is free of issues that plague other Shōnen shows such as villains appearing and disappearing or plot development forgotten when it suits the story. 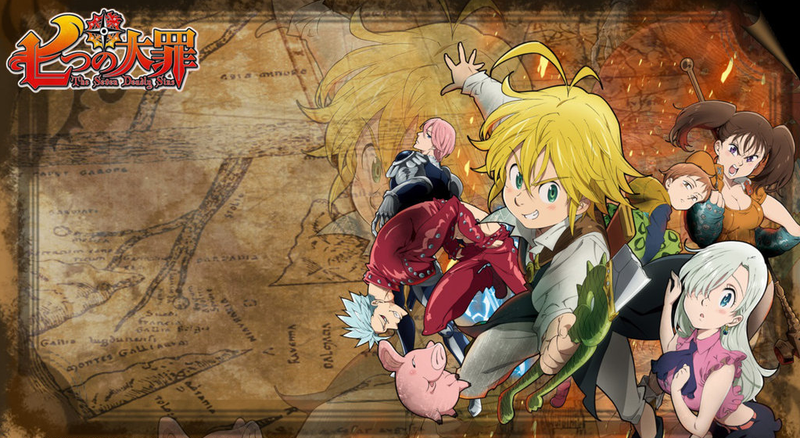 No you can tell right from the start The Seven Deadly Sins has a plan and it’ll take you a while to get there (which is why it’s good Season 2 will be released in 2016). To compare Elizabeth to say Orihme from Bleach, Lucy from Fairy Tail, or Nami from One Piece is mistaken as each of these characters contribute in more then just their image, hell even Bulma did more in Dragon Ball. Sadly Elizabeth really doesn’t and for the majority of the series her contribution ranges from a glorified equipment handler (she throws a sword at one point...) to damsel in distress with very little else... oh yes she is also a waitress at the Sins traveling bar (ya they get drunk a lot it’s actually an endearing quality). Finally this is all the creepier as its known Meliodas is old enough to be her father (despite his youthful appearance) as all the Sins knew her as a child when serving as knights of her Kingdom. Now again I have to reiterate something this is played for humor. Which makes it all the more perplexing as very little modern anime takes the subservience aspect of characters to this level. All around The Seven Deadly Sins should be an easy recommendation for anyone looking for a light and exciting show. However despite the service being quite light comparably within the Shōnen genre (Fairy Tail’s outfits are more revealing a lot of the time for example) the situations present are off putting. In the end I still very much enjoy this show as it’s so much better then it should be for what it is, however their is always going to be a “but” when describing it to friends and fellow anime fans and I find that to be a damn shame. As I said earlier the show is more then the sum of its parts and it’s a real accomplishment to be so good while having something so glaringly bad be a part of it. Still though I got to say if you like Shōnen action anime you owe it to yourself to check out The Seven Deadly Sins as its easily one of the better offerings in the genre currently. It’ll be up to you if you can tolerate or even enjoy its more juvenile side. It’s just that personally I wish that it had a little bit more self respect and would grow up just a little bit.